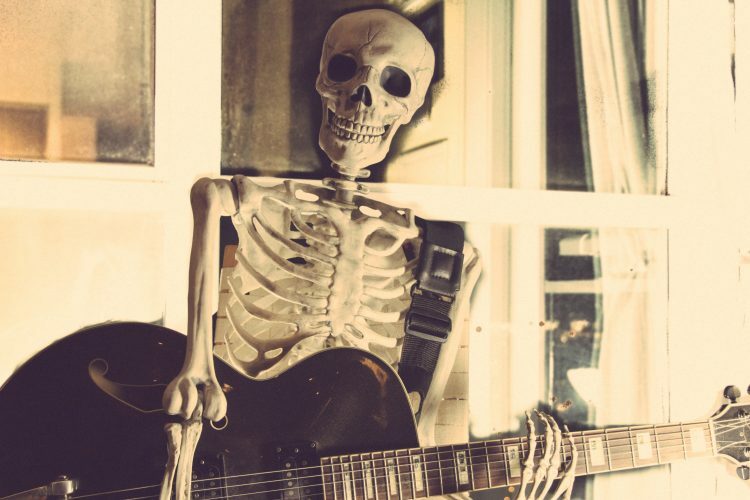 Listening to spooky, chilling songs can be a fun way to ease into the Halloween spirit. Whether they remind you of old horror movies or just sound creepy to the ear, these songs are guaranteed to jump-start any epic Halloween party. Here are 10 eerie songs you should add to your fall and Halloween playlists, available from iTunes and Amazon. Sign up for iRazoo today to earn points that can be redeemed for free gift cards to iTunes, Amazon, and other retailers! The song’s opening line, “Who is this irresistible creature who has an insatiable love for the dead?” is from the trailer of 1971 horror film “Lady Frankenstein”. Additionally, the music at the beginning of the track is from the 1972 trailer of “The Last House on the Left.” The song features several other clips from older horror films. This 1980 classic begins with the slow, eerie tolling of a 2,000-pound bronze bell before transitioning smoothly into a sound complete with guitar, drums, bass, and lyrics. The song was also featured on the soundtrack to Stephen King’s 1986 film “Maximum Overdrive”. Anyone familiar with the 1973 film “The Exorcist” remembers this song’s haunting piano solo featured in the movie. The film’s success helped Oldfield’s song rise in popularity and gain lots of airplay. This spooky-sounding classical masterpiece by Russian composer Mussorgsky is about a witches’ sabbath that takes place on St. John’s Eve. After this piece was created in 1867, everyone in Mussorgsky’s circle refused to perform “Night on Bald Mountain,” and it was never performed in any form during his lifetime. 6. “Ghostbusters” by Ray Parker, Jr.
It’s hard not to sing along with this timeless Halloween theme song to the movie of the same name. Parker Jr. wrote “Ghostbusters” on the fly after hearing a jingle on a late-night commercial that reminded him of the fictional commercial used for the business in the movie. Like Mussorgsky’s “Night on Bald Mountain,” this thrilling classical tune by Berlioz also has a theme based on a witches’ sabbath. Many people today remember this chilly tune being featured in the 1991 film “Sleeping With the Enemy,” in which Julia Roberts is stalked by her dangerous, abusive husband. Halloween would never be quite the same without Jackson’s “Thriller”. The song is best remembered for its 14-minute music video, known as the most influential pop music video of all time. The video features Jackson and dancing crew dressed as zombies attacking Jackson’s fictional girlfriend. This 1962 release maintained the #1 spot on the Billboard chart for the entire week before Halloween that same year. This Halloween classic features spooky sound effects like coffins opening and closing, chains rattling, and cauldrons bubbling. Songwriter John Fogerty says “Bad Moon Rising” is about an impending apocalypse, but many associate the song with werewolves. Either way, the song has eerie lyrics, and has been a Halloween favorite since 1969. Want to earn free gift cards to retail stores in exchange for watching videos, downloading new apps, and completing surveys? Sign up for iRazoo today to start earning free points, then redeem your points for gift cards to PayPal and other major retailers including Wal-Mart, Target, and more!